It’s not just wine connoisseurs who can appreciate the difference a well designed and perfectly matched wine glass can make. This Dartington Wine Master range was created in the mid 1990’s so that you at home could have the best wine tasting experience. With glasses designed with the sommelier in mind, but able to be enjoyed by everyone at home, this collection is sure to please, particularly those wine enthusiasts amongst you. If you favour reds, perhaps a Bordeaux, Shiraz or Merlot then all these great wines have a perfect glass. Or perhaps a Chardonnay or other type of white wine is more your thing or even Champagne, then here you will find a glass to suit almost every occasion. 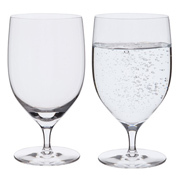 Generally the glasses are sold in pairs so both you and a partner can share the same tasting experience. The shape of each glass is designed to enhance the true flavours and characters of each drink including many of the most popular wines. 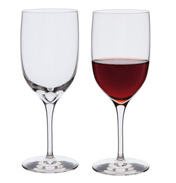 Fine wine drinkers appreciate the Wine Master Glasses’ ability to do just this. The wine glass material of choice is of course fine crystal. These glasses, although things of beauty, do not come with decorations which may be detrimental to the tasting of the wine. Every aspect is designed to enhance the bouquet and aroma of the chosen grape. True appreciation starts with the right glass so make sure you give your wine the glass it deserves. No two wines are the same and each wine has characteristics which are different to any other. Dartington have spent time researching the requirements for each selected grape or region resulting in a range which is specially created to indulge and pamper the senses and for an exciting experience in every glass. Complex flavours, aromas (or bouquets) and subtle nuances are brought alive and emphasized. 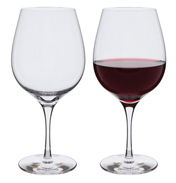 Red wine glasses generally are quite tall, and have more curved, broader bowls to increase the oxygenation rate and the Bordeaux and Burgundy are particular wines which have unique styles of their own. 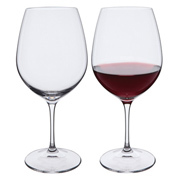 The Bordeaux glass has a wide bowl, and is suitable for full bodied reds as it directs the wine to the back of the mouth together with a straight, wide rim, both of which help to soften tannins. The Burgundy glass is broader still to help accumulate the aromas and bring alive the flavours and allowing them to harmonise. 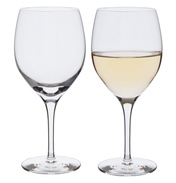 In contrast white wine glasses can have a wide different variety of shapes and sizes. 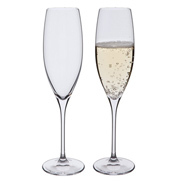 You have the thin, tapered Wine Master champagne flute which helps the bubbles develop and also concentrates the delicate aromas. Then a glass such as the Chardonnay which has quite a short bowl allowing the fruity aromas to mingle with the oaky flavours and bring these closer to the nose. 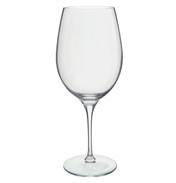 Then the all rounder white wine glass which is taller and designed for crisper, unoaked whites. 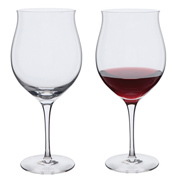 The Wine Master Port glass is slightly larger than normal port glasses, and as well as allowing you to pour yourself a more generous measure it is designed so to allow the flavours to fully develop and reach your nose. Start off your collection today and marvel at a new way in which to enjoy your favourite wines. When crystal manufacturers design glassware – particularly designs produced to enhance the tasting of wine and to give the best tasting experiences – there is a lot more to this process than one might first think. Key elements of the glass need to be considered including the rim, bowl shape, balance, type of stem and the materials used in the glassware itself. Stating with the actual materials used to produce the glasses it is thought that glass or the clearest crystal is the best – durability, clarity and thickness are important. 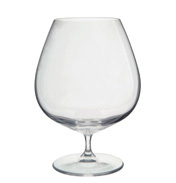 The glass needs to be as transparent as possible to appreciate a wine’s true colour and condition – a lot can be found about a wine (age and grape type for instance) from the way it actually looks so it is important that the crystal is very clear and preferably quite plain so nothing departs from the ability to read this information. A coloured glass, or one made from metals for instance, would not allow this to be seen and any decoration of cut glass would also detract the eye. A scratched glass is also not ideal, hence the reason for choosing the finest crystal which is harder and less likely to scratch during use. Also the glass cannot be too delicate, strength is important so it can be reused and cleaned. Looking at the rim next – this is important in allowing the wine drinker to taste the wine effectively, both through ability to deliver the wine into the mouth and for the actual taste. A rim should be smooth, clean cut and quite fine. This will allow the wine to pour easily into the mouth via the lips without dripping, be comfortable and generally the finer the rim the more the taster will appreciate the wine and not the taste of the glass. Talking of the rim, can you make your wine glass sing? Wet your index finger with water and run it along the edge of the wine glass rim, adjust the pressure and keep it moving around until you hear the glass ‘sing’. You may have to keep applying a little more liquid to make this work – and try experimenting with different volumes of liquid in the glass to change the pitch of the sound. You may wonder why this happens – well it is all to do with the glass’s resonant frequency which is basically the natural frequency at which it vibrates. By applying pressure and movement with your fingertip you are giving the glass molecules energy and give it a wave of vibrations which travel through the glass. These vibrating glass molecules cause the air molecules to vibrate at the same rate and these air molecules vibrating give off the sound you can hear. (The water is required to give better contact to the glass as the finger is naturally quite dry). If the glass has liquid in it the pitch is changed by the interaction of the water molecules reducing the energy flowing through the glass. Theoretically you could shatter the glass if the vibrations gave enough energy to meet the resonant frequency of the glass however do not worry this is far more energy than you could give by the simple movement of the finger. Some singers however, with finely tuned voices to match that of the resonant frequency of the glass, can actually achieve this shattering with the sound of their voice – amazing! 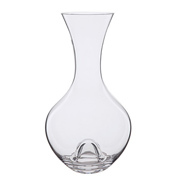 Next look at the wine glass bowl – two key elements to look for are the shape and capacity. The proportions required differ quite a bit depending on the type of wine selected for tasting. The bowl should be large enough to have an appropriate measure and also large enough to allow swirling without spilling any of the contents. Swirling is thought to allow the aromas of the wine to be released. For swirling the bowl needs to bulge towards the base and narrow towards the rim to concentrate and direct the aromas towards the nose. Generally red wines are best with a larger bowl, sparkling wines a flute, and whites have a smaller bowl. The bowls need to be as thin as possible. The size of the bowl also affects the temperature of the wine and this is one of the reasons why the white wine glass generally has a smaller bowl – this prevents too large a measure being poured so that the wine is drunk more quickly and as such is likely to be tasted at the correct temperature. If more wine is poured, the taster takes longer to drink and as such the wine is more likely to warn up the longer it stands around. This is something not recommended for whites which are generally served around 8-10 degrees c for a good quality wine, a little cooler at 4-8 degrees c if the wine is inexpensive or sparkling. By comparison red wines are best served at around 14ºC to 18ºC. The balance of the glass is also vitally important. They need to feel good in the hand whatever the volume of wine in the glass. This balance comes through the interaction of the foot, stem and bowl together. The glass needs to be safe when standing and at no risk of toppling over. The weight needs to be carefully balanced so the glass sits comfortably in the hand, whether held by stem, base or bowl, what ever the user’s preference. Next when considering the stem this needs to be long enough to allow the taster to hold the glass by the stem and not by the bowl. Holding a glass by the stem prevents any body heat being transferred into the wine which may impart on flavour. It also allows the glass to be held up and the view of the wine through the bowl to be fully appreciated without the hand obscuring the picture. The stem also allows any greasy fingerprints to be left on the stem and not the bowl. If you look at serious wine tasters you will note they always hold the glass by the stem so try to get into this habit too. The stem should always be vertical and the longer the better allowing the wine aromas to reach the nose more easily. 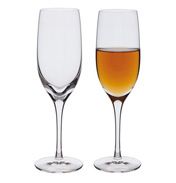 So you can see there are a lot of factors to take into account when making fine wine glasses. Here at WWSM you will find a large array of glasses all beautifully designed to take these matters into account.